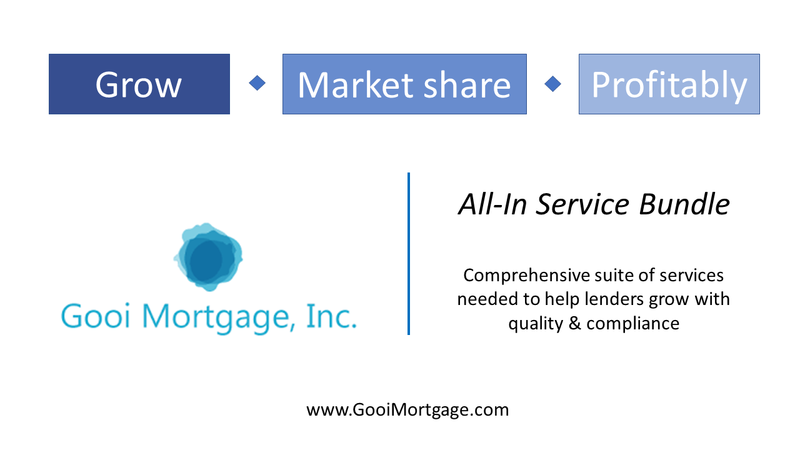 Banks, credit unions and mortgage bankers of all sizes can literally just 'feed the machine' with qualified mortgage leads and let Gooi manage the entire loan process, as well as the secondary market transactions via their partner network. A private label option is also available, as is an à la carte menu of individual component services should clients not want to go 'All-In' to start. Lenders can still maintain control over product and pricing, which is a must-have. Gooi's pricing model is simple and easy... One simple component or bundle of services, one simple per-file price. In speaking with Laura Rosenberger, Gooi's SVP of Sales & Marketing, this service bundle solution is in direct response to the evolving market conditions, whereby the cost of compliance, and its impact upon lender margins, continues to squeeze the industry's originators. Rosenberger also confirmed a trend we have written about repeatedly, where in tough times like these, the natural instinct is for lenders to scale back and focus on in-house core competencies and look to outsource most other components to high quality vendors in a variable cost model. Once you have selected a true partner, jointly develop and execute a transition plan that achieves each party's objectives and timelines. Make it a two-sided collaboration. Don't ever go for the cheapest... We have been doing this long enough to promise... "YOU ALWAYS GET WHAT YOU PAY FOR." Your vendor partners should always be seen and managed as a direct extension of your own operation and brand. The moment you see and treat them as a ‘vendor,’ it’s a detriment. We have engaged in client discussions for many years about the Pros and Cons of outsourcing, and everyone understands the concept of reducing direct headcount and the variable cost model. Many become a bit more enlightened when they also contemplate other line item saves: Office space, utilities, furniture, PCs/Laptops and related service agreements, insurance, phone and other computer equipment, and more. There is no doubt our lender friends are enduring winds and pressure. Fortunately, our industry continually evolves and adapts, presenting some compelling options.